Pleasurable Hobbies: Things to be thankful for! You have completed all stages of the Graduation Audit Process at this time. We are pleased to announce that your degree will be conferred on 8/15/2009. Your two official transcripts conferring your degree will be sent out two weeks after your conferral date. 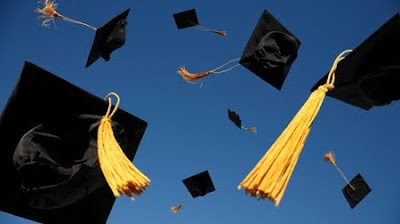 Your official diploma will be soon to follow approximately four weeks after the conferral date. I know, some of you might raise an eyebrow if I told you that I just have now completed my associate degree (at my age). I did not give much weight on the importance of having a degree then, not too much inspiration I guess. But having my kids and my wife, it did inspired me to continue with my education. I am also determined to finish my bachelor's degree next year after my retirement. First of all I thank God for giving us the courage to carry on despite of difficulties, for giving us inspiration everyday, and for giving us what we need! wohooo! comgratulations John...you deserve it! Wow, you are just amazing and inspiring and informative too. Congrats and thank you. Congratulations! It is never too late to achieve anything! The fact that you tried to finish a degree despite already having a family of your own, sets a good example to those who thinks it's too late to study again. Surely your lovely wife and adorable kids are so proud of you! congratulations. so happy for you. At the age of 31 i also enrolled taking a course in computer troubleshooting. My classmates were 99% male and their age rangers from 18 to early 20s. Just imagine i was out numbered and i was already on my early 30s then. One class mate asked me " You are too old to go back to school. Are you not making a mistake by enrolling? You should be at home cooking." I just smiled and said "Sorry if you feel that way but i thought education is for every one, regardless of gender and age." I graduated and that had been my ticket for being a technical support. Hence, i am so proud of people like you who still take interest in education..despite the age! It does not really matter what age you are in studying and learning, right? By the way, thank you for your comment and for visiting my blog. hi John, congratulations! you've done it. congratulation to you john. Very well done! Thank you everyone for the kind words, I really appreciate it. Since I'm usually the oldest guy in the classroom, I get stared at for about the first week of class until everyone gets a chance to meet me. Usually the first question I receive when I walk in the classroom is "Are you the instructor for this class? I just smile and take a seat. I've found that providing the youngsters with free tutoring usually gains rapid acceptance. I get asked a lot of questions about my life and the military. I truly believe that learning is a forever process and the older I get, the more I want to learn. Congratulations John! Yeeehhh... You guys are awesome, eventhough you both are busy with your handful of chubskulit you still have time for fun and studies and blogging. Blogging really helped us too, we bought a washing machine from the blogging money. way to go John!you deserved a pat on the back for your achievements.